There are two big projects slated for a vacant shopping mall here. One, a medical marijuana production center and dispensary, has been utterly uncontroversial. The second, a destination casino resort, has divided the city. “This is an attack on the Bible Belt,” says Dewey Williams, an evangelical Baptist preacher who leads a congregation of 300 in the city. A history buff and avid hunter, he’s sitting in his basement office, which is wrapped in Civil War themed wallpaper and contains no fewer than three taxidermied raccoons. He says he’s seen cannabis help sick people. And he says he’s seen the harm casinos can inflict on people who develop gambling addictions. “I don’t think anybody in their right mind could say if we get a casino we’ll be safer, we’ll be happier, families will do better, there will be less suicide, less divorce,” he says. City Council members, who lead one of the state’s most fiscally distressed localities, disagree. They’ve unanimously backed both projects, citing the economic potential they would bring to a region that’s struggled amid the decline of manufacturing and coal industries. The move might sound surprising. 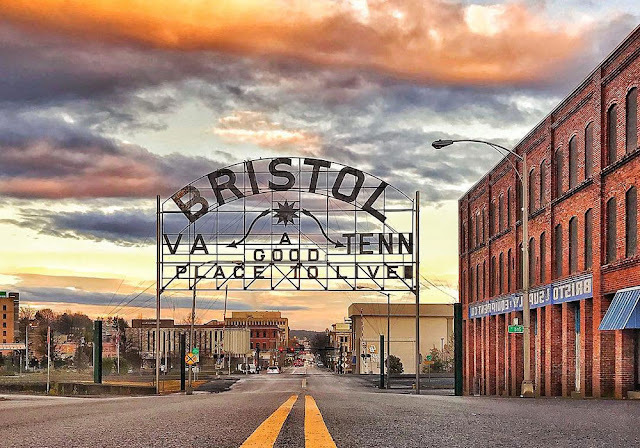 The small Southwestern Virginia city with a downtown that straddles the Tennessee border is among the most conservative in the state. The city’s roughly 17,000 residents delivered the second highest proportion of voters for President Donald Trump of any Virginia city. But on the marijuana front, it tracks neatly with national public opinion polling on the subject, which has consistently shown growing support across the political spectrum to liberalize marijuana laws. The project is already moving forward after a local firm won one of five state licenses to produce and dispense THC and CBD extracts. The casino proposal, meanwhile, has drawn strong opposition from some on social and moral grounds, mirroring the traditional stance of Republicans in the General Assembly, who steadfastly voted down proposals floated by Democrats in past years. In an about face at Bristol’s behest, though, they agreed last month to begin developing gaming regulations and pay for a study to inform a final decision next year. Gov. Ralph Northam signed the legislation Friday. While opposition is vocal, walking around downtown, you’re just as likely to run into supporters of the project, who note the potential for several thousand new, good-paying jobs in an area where industries tend to leave, not plant roots. “It does seem counterintuitive to what we would expect from a socially conservative area, however I think people realize that unless we do something different, Bristol will not be the same 10 years from now,” says City Manager Randy Eads. Bristol does not look like a city in fiscal distress. Unlike the boarded-up downtowns that dot southwestern Virginia, the city bustles with shops, bars and restaurants. It’s home to two theaters, four new breweries, a boutique hotel and a museum dedicated to the city’s roots as the birthplace of country music. The nearby Bristol Speedway has a capacity of 165,000, boosting the area’s name recognition and bringing a steady stream of tourists to the area. But two terrible financial decisions haunt the city. One’s a landfill. The other is a shopping and retail development. Neither has worked out the way city leaders had hoped. The landfill failed to attract the anticipated regional and out-of-state tipping fees but, because it was built in an old limestone quarry, it still requires a $2 million new liner every two years regardless of how much trash gets dumped in it. And the retail development, which required the city to level a limestone ridge at great expense, has largely failed to attract anticipated big box retailers. Between the two, the city is $108 million in debt — a huge number for a city with an annual budget of just $55 million. All this has made the casino proposal floated by two local coal barons, Jim McGlothlin and Clyde Stacy, particularly appealing. The pair has pledged to invest $250 million in the project and estimate it would bring in $27 million in tax revenue for the city by year seven. The figure doesn’t include the additional taxes the state would assess on gaming revenues. Eads, hired by a new City Council, said the city isn’t pinning all its hopes on the project, but he says it’s one of the better prospects on the horizon. Bristol Station Brewery & Pub opened four years ago in the city’s old Greyhound depot and is known for its vanilla imperial porter. Pouring beer behind the counter, bartender Travis Tomlinson says his family is split over the proposal. He supports it, largely because of the number of jobs he’s been told it would bring — an estimated 5,200 — and the salaries they would command — an average of about $47,000 a year. “That seems decent for this area,” he says. A similar dynamic emerges in conversations around the city, and they don’t all hinge on religion. At Top Hat Magic Supply, Dave Vaught makes no secret he’s devoted to his faith. He points to a lighted portrait of Jesus on the wall and says he asks all the young magicians who come in to pray for him and his shop, which he says has miraculously survived as most have closed amid fierce competition from online retailers. “He’s the only reason I’m here,” he says. At the pawn shop around the corner, Tammy Baines works behind the jewelry counter and worries about the struggling customers who might be drawn in. Gambling addiction is real, she says, and many vulnerable residents are barely getting by as it is. On top of that, she questions the wisdom of pinning hopes for the area’s future on a casino development when similar efforts are failing around the country. The project’s backers are aware that casinos around the country have struggled with increased competition as more and more states have opened their doors to full-scale gambling operations. But they argue the Bristol area is fundamentally different. For one, there aren’t as many nearby casinos. To the west, neither Kentucky nor Tennessee currently allows casino gambling. The closest to the area is a tribal casino in North Carolina operated by Harrah’s about two and a half hours away by car and not particularly close to a major interstate. Bristol, meanwhile, sits right off Interstate 81, and, unlike some smaller localities that have tried and failed to grow a casino business, the city already draws a decent tourist trade. “We hope we’ll kind of supercharge that,” says Jason Eige, the vice president of McGlothlin’s United Company. The United Company was formed as United Coal Company in 1970. McGlothlin still has holdings in the coal business, but as the industry has declined, he’s moved into recreation and now owns a handful of RV parks and golf courses. His partner in the casino venture, Stacy, a former high school classmate who also made his fortune in coal, recently purchased the vacant Bristol Mall with the intent of turning it into an industrial park but was unable to land any tenants except for Dharma Pharmaceuticals, the medical marijuana business in which he is an investor, according to the Bristol Herald Courier. The pair’s representatives say they have no interest in trying to win over people who object to the casino on religious grounds, though they say they have reached out to faith leaders to see if they’d like to offer on-site gambling counseling. In either case, they think they can win enough support in a local referendum that would eventually be required for the project to go forward with or without their support. “If it’s a matter of your faith and your theology, then, perfectly understandable — we get that,” Eige said. As to concerns about problem gamblers, they say there are already plenty of opportunities for people in the state with such an affliction, citing the state lottery, online gambling and the slots-parlors the General Assembly approved last year to support the state’s horse racing industry. Before this year, Portsmouth — a majority Democratic city across the state from Bristol and facing its own financial predicament — had tried and failed to get the Republican-led General Assembly to approve casino gambling five times. By the 2018 session, it had become something of a laugh line. Members of the Senate committee that took up the legislation chuckled as Sen. Louise Lucas, D-Portsmouth, approached to make her case. “Sen. Lucas, I applaud your determination and on behalf of the timber industry I appreciate all the paper we’ve used,” said Sen. Frank Ruff, R-Mecklenburg. The legislation was voted down along party lines, with Democrats supporting, noting the economic potential, and Republicans opposing. Bristol’s interest this year changed everything. McGlothlin and Stacy partnered with leaders in Portsmouth and Danville and, perhaps most importantly, brought in a team of eight lobbyists and dumped more than $500,000 into Republican and Democratic campaign accounts, according to the Virginia Public Access project, which tracks money in state politics. Eige and United Company President Martin Kent estimate that all together, the two men invested a total of $1 million on the legislative push. The city’s state senator, Bill Carrico, who recently announced his retirement and was among the most socially conservative in the General Assembly, signed on to back the legislation while repeatedly vowing he himself would likely never set foot in the casino. However, he said leaving it up to local voters in a referendum was the right thing to do. Williams, the Baptist minister, doubts that opponents would stand a chance with all the money the casino’s supporters could bring to a local campaign. In the hallway outside his office, he has stacks of anti-casino yard signs. “We will put up a fight, you know, best we can,” he says. In the end, their efforts didn’t win them final approval, but they did move the ball forward in a big way. The legislation created the Casino Gaming Act, calls for an in-depth study on casino gaming to be completed by the assembly’s auditing arm by Nov. 1, and requires the state lottery board to begin developing regulations. They still face a potentially uphill battle next year. Republican House Speaker Kirk Cox, whose political action committee received a $250,000 donation from the backers and their associates, made clear he remains skeptical and fought for a study that would also address the basic question of whether the state should legalize gambling, rather than just how it might do it. Until next year, local leaders say they’ll wait, watch and continue to make their case. Oh, and continue to try to get permission to move the medical marijuana business out of the mall. They need the state pharmacy board, which issued the highly-sought after permit in part based on the location, to approve a move. The board has already denied the first request. But pretty much everyone in town agrees that while the businesses could coexist in the mall if necessary, having them under the same roof might be a bridge to far, even for a struggling city. “We don’t think it’s the best option to have them both operating simultaneously in the mall,” says Eige, of United Co.
“But we ultimately don’t think that will be a problem,” Kent, the United Co. president, says.